Where will Qatar put tens of thousands of football fans who will descend upon the nation for the 2022 World Cup? 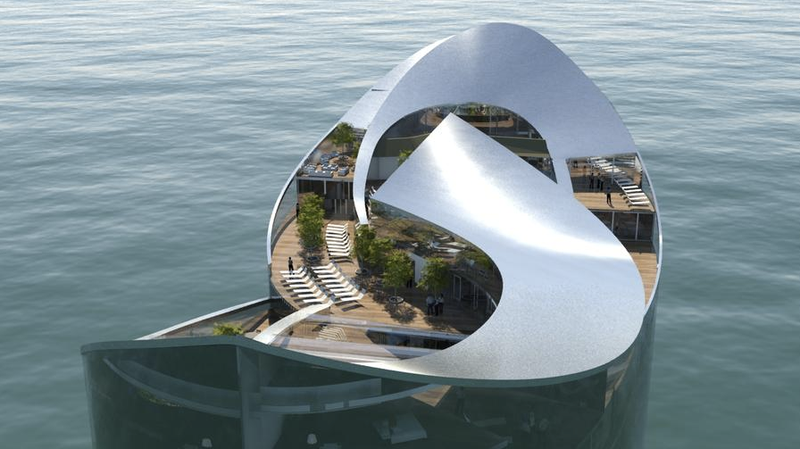 One proposal is to create an off-the-grid floating hotel island that could be towed to a new location once the tournament is over. Sigge Architects and ADMARES/ALMACO have been developing a floating hotel concept, and Qatari authorities have expressed interest in the idea as a possible way to accommodate World Cup visitors. The proposed $5.5 million hotel would be able to operate independently of Qatar's energy and waste infrastructure, with its own sewage treatment, energy generation, and recycling system, and it could be built by the construction team off-site (by ALMACO, hopefully avoiding the slave labor that has reportedly been used in other World Cup preparations) and then hauled to its docking grounds when it's finished. Of course, after the hiccups with event housing in Sochi, you'd definitely want to be sure that the hotel was finished and perfect well before the matches began. One of the possible advantages of this idea is that the hotel wouldn't have to reside in Qatar permanent once the Wold Cup is over. The building could be moved to another coastal venue and repurposed for a different high-traffic event. Then again, it could always serve as headquarters for a seafaring villain.